Check out our live coverage of the 2016 COSAFA Under-20 Championships Group C clash between Mauritius and Angola at the Moruleng Stadium. This is a winners-takes-all clash for top spot in the pool, though Angola need just a draw to ensure they book a semifinal spot. Mauritius XI: Herbert Nany, Neelesh Gukoola, Emmanuel Vincent, Guillaume Vielleuse, Marcus Dimanche, Dimitri Ova, Alex Ferre, Jean Saramandif, Louis Jackson, Arnauld Bettang, Damion Wilson. Angola XI: Joao Eduardo, Mario Balburdia, Pedro Alves, Joaquim Balanga, Nelson Mudile, Calebi Yanda, Nelson Da Luz, Félix Vladimiro, Fernando Morais, Alberto Miguel, Zinadine Catraio. FULLTIME: The game ends 1-1 and Angola are through to the semifinals! 80′ – RED CARD! Angola’s Fernando Morais is shown a red card by the referee! 79′ – Desperation slowly creeping into the Angolan side as they are now unnecessarily losing possession in front of the Mauritius box. 72′ – Yellow card to Angola’s Vladmiro Etson for feigning injury inside the Mauritius box so as to get a penalty. 68′ – Angola keeper Joao Eduardo keeps Mauritius at bay as he blocks a shot on target by Jean Anderson. 67′ – Angola’s Nelson Coquenao is denied a clear scoring chance as Mauritius goalie Nany tips his one-on-one effort for a corner. 60′ – Angola sub: Jose Afonso comes in for Zinedine Catraio. 57′ – Mauritius sub: Aurelien Pele in for Marcus Dimanche. 56′ – Angolan player Vladimiro a shown yellow card by the referee for rough play. 51′ – GOAL! Rudy Vincent equalises for Mauritius from the penalty-spot after their striker Jean Sarah was hauled down in the box by Pedro Alves! 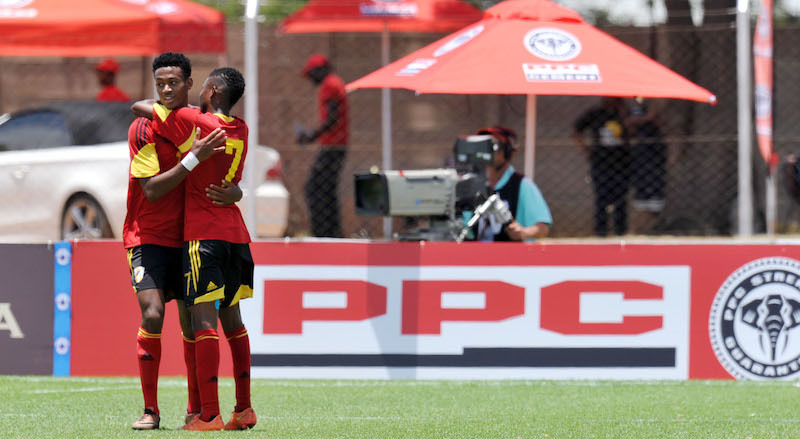 HALFTIME: Angola leading Mauritius 1-0 at the break and it could have been more! 33′ – GOAL! The Mauritius defence finally gives in as Felix Vladimiro breaks the deadlock! 32′ – Angola’s Caleb Yanda’s shot goes off target as they keep the pressure on Mauritius. 25′ – Angola on the offensive as Mario Balburdia takes aim at the Mauritius goal but the goalminder, Herbert Nany, would not have any of it, parrying the ball back into play for his defenders to clear. 24′ – Mauritius sub: Jean Sarah is going to come on to replace a limping Jean Saramandef. 18′ – Angola’s Da Luz agonises as his pile-driver from 30 metres flies over the Mauritius goal! 12′ – Angola pile on the pressure forcing Mauritius onto the back foot, conceding two corner kicks inside three minutes. 10′ – Ten minutes played so far. A lukewarm game as both sides seem to be losing the ball quickly owing to poor build-ups from the back. 2′ – Angolan Calebi Mateta Yanda is harped down inside his own half. 1′ – We are off in the match between Mauritius and Angola! – The referee for today’s clash is Jonas Shongedi from Namibia.